VITEEE Counselling 2017- वेल्लोर इंस्टिट्यूट ऑफ टैक्नोलॉजी इंजीनियरिंग प्रवेश परीक्षा काउंसलिंग) is going to be conducted tentatively in the 1st or 2nd week of May 2017. The counselling session is going to be carried out in two phases- Phase I and Phase II for all the applicants who have appeared in the online engineering entrance exam which is conducted by VIT University. Through VIT Counselling 2017, the eligible aspirants will be provided admission into its engineering courses at its Chennai and Vellore Campus. The VITEEE Counselling schedule 2017 is going to be held on different dates on the basis of candidates rank in VITEEE 2017. The VITEEE Counselling Procedure for the allocation of branches to the shortlisted candidates will be on the basis of the All India Rank of the candidate. Candidates looking for admissions in B.Tech courses offered by VIT University must qualify the VITEEE 2017. Eligible candidates whose name appears in VITEEE Merit List will be called for Counselling which is to be conducted in 1st or 2nd week of May 2017. The VIT admission process will be done through single window system at its Chennai and Vellore Campuses. The registration for the counselling will be done in the online mode. 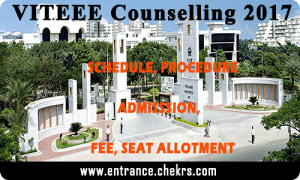 As per the university norms, the applicants must submit their counselling center choices two days before their schedule for appearing in VITEEE 2017 counselling. He/She must also download their VITEEE counselling card 2017. Applicants will be selected for counselling process on the basis of their performance in the VITEEE 2017 exam. Candidates must register themselves for appearing in the counselling process. Candidates have to choose and submit their VITEEE 2017 counselling center two days before the counselling. Admission process will be organized at Chennai & Vellore campuses through single window counselling. Shortlisted candidates must report for the counselling at the campuses as per their preferences. The seats will be allotted to applicants on merit basis and as per the availability of seats. In case a candidate is not able to participate in the counselling of VITEEE 2017, then his/her seat will be offered to the candidate next to him/her in merit list. All the Shortlisted candidates must pay counselling fee of Rs. 50,000 through demand draft (DD) drawn in favour of “VIT University”, payable at Vellore on confirmation of accepting the allotted seat. The Fee of Rs. 50,000 fee includes Rs. 10,000 counselling fee, which is non-refundable, however, this amount will get adjusted in tuition fee of VITEEE 2017 once the academic session starts. the process of VITEEE Seat Allotment 2017 for B.Tecprograms will be done completely on merit basis and as per candidates preferred choice. Those candidates who have registered for the counselling process and filled their preferences will be allotted their respective seats. If an applicant does not appear in person for the counselling process, his/her seats will automatically be transferred to the next candidate according to merit basis. Aspirants can now check more details upcoming details of VITEEE Counselling 2017 by visiting our portal frequently. Here we also notify our readers the Top Engineering Colleges of India and get to know about Engineering Colleges.